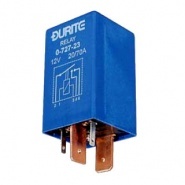 12V, 70A-20A split charge relay, isolates fridge circuit, 2 x 2.8mm, 1 x 6.3mm and 2 x 9.5mm terminals, replaces Lucas SRB630. 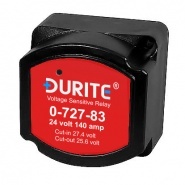 Durite 12V 140A voltage sensitive relay for split charging, with red LED indicator, makes at 13.3V and breaks at 12.8V. 24 volt 140A voltage sensitive relay, with red LED, makes at 27.4V and breaks at 25.6V, allows split charging of second battery bank. Charge splitter or electronic split chargers from Arc Components Limited. The range of splitter or split devices available online allow charging of more than one battery at a time. 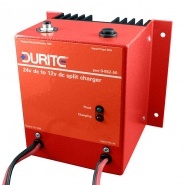 Designed for 12V dc and 24V dc automotive battery systems, the latest technology Durite battery split chargers ensure a reliable and cost-effective solution to vehicle power management. 24V DC to 12V DC 20A Split charger, designed to charge and maintain a 12V battery from a 24V DC system. 12V DC to 24V DC 10A Split charger, designed to charge and maintain a 24V battery from a 12V DC system. 12V DC To 12V DC 20A Split charger, designed to charge and maintain a separate 12V battery from a 12V DC system. 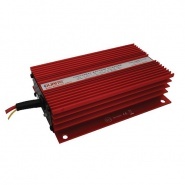 24V DC To 24V DC 10A Split charger, designed to charge and maintain a separate 24V battery from a 24V DC system. 12V to 12V DC 30A Universal split charger, designed to charge and maintain a separate 12V battery from a 12V DC system. 12V to 12V DC 20A Universal split charger, designed to charge and maintain a separate 12V battery from a 12V DC system. 24V to 12V DC 30A Universal split charger, designed to charge and maintain a separate 12V battery from a 24V DC system. 24V to 12V DC 20A Universal split charger, designed to charge and maintain a separate 12V battery from a 24V DC system.